While traveling through Patagonia one can expect to see lots of mountains, find many opportunities for trekking, and travel through many kilometers of flat, never-ending land. 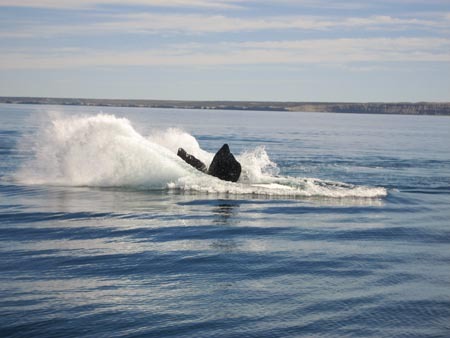 It is easy to forget about one other great stop along the way that stands out among the rest – Puerto Madryn. 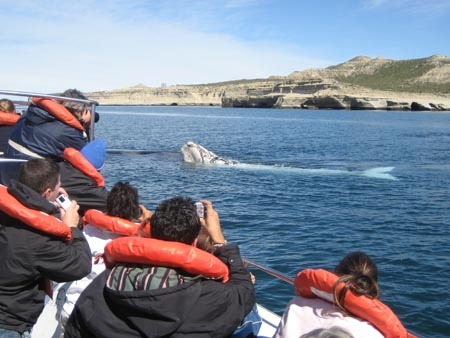 Puerto Madryn is the gateway to Peninsula Valdes where numerous tours take place every day for the traveler who is anxious to experience the awe and wonder of the sea creatures and to go whale-watching. At certain times of the year, one can see the whales playing in the water from the beaches of the city. I was fortunate enough to be one of these people. After arriving in Puerto Madryn I decided to take a day to relax. I was lost in the peace and tranquility of the little town while strolling along the beaches, watching the kids chase after the crabs, and collecting seashells along the shore, when I witnessed my first whale jumping in the near distance. I was amazed and very intrigued. The whales I saw from shore inspired me to start planning my trip to Peninsula Valdes so I headed back into the city. There are an endless number of travel agencies scattered throughout town that all offer similar packages for comparable prices. After talking with a couple of the agencies, I booked a tour with a company called Abriendo Huellas, which offered front door pick up and very useful information. 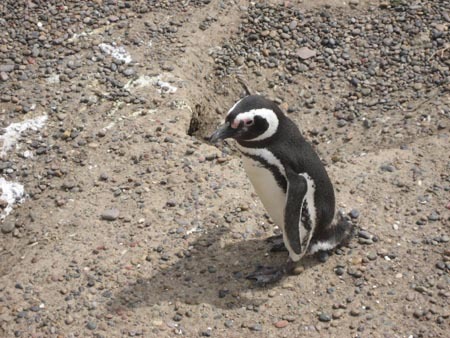 The next morning I jumped in a van with a group of eager tourists and was swept away into a full-day excursion which included whales, penguins, dolphins, orcas, elephant seals, guanacos, maras, armadillos, and more. The guides were great and were so excited about sharing this part of nature with us travelers that they even pulled over to the side of the road when they saw a snake slithering by, and on one other occasion a tarantula. The bus ride and seeing all of the wildlife was great. But the highlight of the trip was without a doubt the boat ride. After entering the Natural Protected Area of Peninsula Valdez, we entered a small village called Puerto Pirámides that thrives off of the business it receives from tourists. Bahía Ballenas Backpackers Hostel is located in this tiny town for those who want to stay a night with the whales. I never slept in the hostel but I heard that while staying there you could wake up early enough to beat the crowds out to the water, climb out on to the furthest point in the shore, and marvel in the beauty of the whales that surround the area. With the tour I went on, we arrived at Puerto Pirámides and boarded a boat. As we went farther and farther out into the water there were whales surrounding us that were bigger than the boat itself. They are very curious creatures and treated us as if we were another member of the fish family playing out in the water for the day. Occasionally one would swim directly under us and I was sure that if someone were to have reached their hand out they would have been able to touch one of its huge fins or tail before it ducked down beneath. There was even a baby albino whale in the area. The guide informed us that it was born with a skin pigmentation problem and clings to its mother for protection. The best part of the trip, however, was when the whales started jumping. There was one whale specifically that was the star of the sea that day. Every time he jumped the fans on the boat would get more and more excited and within no time he was showing off his skills. The whale probably jumped 20 times all within 100 yards of the boat. It was amazing. I tried to force myself to put down the camera so I could fully appreciate the moment, but human nature took over and I was determined to capture a photo or a video of a whale in mid air. The boat ride eventually had to come to an end, but the tour was far from over. We made various stops along the Peninsula where we watched and learned about the other sea creatures. There were giant elephant seals soaking in the sun on the beaches, orca whales teaching their babies how to swim in rough waters so they could prepare for their annual migratory trip, and penguins that were anything but shy and walked around us as if we were members of their community. It was a full day of activities and a great way to witness the wonder of the sea animals. If you find yourself needing a break from the mountains and trekking in Patagonia, Puerto Madryn and Peninsula Valdes make a wonderful stop and will give you an experience you will never forget. Loved your pics, my trip was such an awesome experience. This page rendered in 0.972 seconds.